Fringed with rich aquatic biodiversity both along shores and inland fresh waterways, Thailand’s marine life plays an integral role in Thai society. The farming of marine species including shrimp, prawns, muscles, finfish and cockles is a major aspect to the economy and culture of Thailand. Salt water (brackish) aquaculture accounts for approximately $1.46 billion of Thailand’s global exports and creates 662,000 jobs (Pongsri, C., & Sukumasavin, N., 2005). Freshwater aquaculture provides vast amounts of food for the local population and contributes to ancient customs and traditional cuisine. The magnitude and intensity of aquaculture has vastly increased during the past decade during which pesticides, fertilizers and hormones have become mainstream and easily accessible to Thai farmers. The serious, often deadly, environmental and health side-effects are becoming ever more apparent as Thai aqua-farmers have turned to these petrochemical products to keep up with ever-growing demand for seafood. 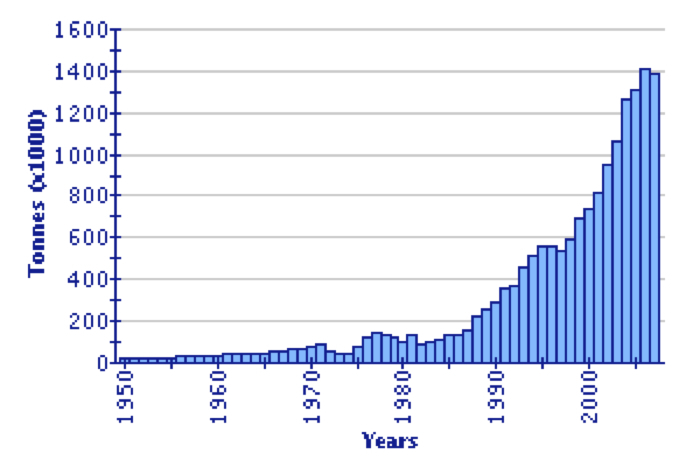 According to J. H. Primavera (1997) in his article “Socio-Economic Impacts of Shrimp Culture,” 27% of the world shrimp production comes from farmed versus wild sources. Primavera illuminates the fact that this inordinately heavy reliance on shrimp farming (and aquaculture in general) places a variety of severe consequences including “conversion, expropriation and privatization of mangroves…salinization of water and soils; decline in food security; marginalization of coastal communities, unemployment and urban migration; and social conflicts” (p. 815). In 2004 there were approximately 440,00 registered freshwater farms in Thailand. Farms are comprised of ditches, cages, ponds and paddy fields in which a variety of marine animals are raised for food. Catfish is the primary animal farmed along with the Nile Tilapia, Java Barb, Snake Skin Gourami, Giant River Prawn, Green Muscle, Soft-Shell turtle and more. The two species that are the farmed in the greatest quantity are both non-native species. These exotic species were bread to grow faster, have larger yields, be more disease resistant, and provide the best flavor for consumers (Pongsri et. al., 2005). 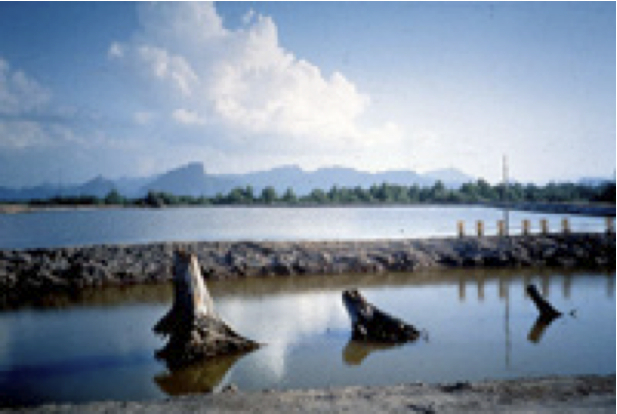 Brackish water aquaculture is the dominant form of aquaculture and food production export in Thailand contributing approximately 300,000 tons annually. Compared to freshwater aquaculture, brackish water farming generally produces higher yields in quantity and monetary measures. Relatively few species are farmed in brackish aquaculture compared to the abundant freshwater varieties. Among the most commonly farmed are finfish including groupers, green mussels, and giant tiger prawns. Marine farming has historically played a vital role as part of Thailand’s food shed. Beginning in 1993, Thailand has consistently been the global leader in fish and sea food exports. Economically, aquaculture provides not only jobs for fishery farmers and operators, but generates food security and opportunities for development in storage, processing, chemical production, marketing and fish feed production in Thailand. Aquaculture accounted for approximately 2.07 percent of the Thailand’s gross domestic product in 2002 (Pongsri et. al., 2005). The importance of aquaculture to the Thai economy and livelihood is somewhat troubling as the market’s environmental impacts have become increasingly apparent. Currently, Thai fisheries are operating above the maximum sustainable yields in an attempt to keep up with ever increasing domestic and international demands for sea food. In the article “Water Quality in Shrimp Ponds,” V. J. Cowan, K. Lorenzen and S.J. Funge-Smith (1999) explain that water quality is one of the main environmental concerns in the aquaculture industry. Poor water quality leads to poor quality shrimp and other farmed organisms as growth is stunted and or reduced, disease resistance is weakened and direct mortality rates increase (p. 124). Thai fisheries are commonly characterized by having “low rates of water exchange” and long retention times which means that the farming practices will have long lasting effects on the local environment. Intensive farming relies on copious inputs of chemical enhancing substances. Such inputs exceed the pond’s natural ability to “maintain suitable water quality conditions” (Cowan et. al., 1999, p. 124). Deforestation and destruction of natural mangroves to produce aquaculture ponds can also cause serious degeneration of swamp habitats. This reduction in habitat combined with the introduction of exotic farmed species results is serious competition for food and space for local species (Federico Paez-Osuna, 2001, p. 131). As discussed by Cowan et. al. (1999), the current methods implemented attempting to reduce the environmental degradation are ineffective (para. 840-843). Also, there is very little statistical information available to adequately measure the effects of aquaculture, especially in more rural areas. In order to accurately asses the true ecological impacts of marine animal farming, more research needs to be undertaken so new technologies and practices can be developed and implemented. The disconnect between farmers, environmental researchers and the general public can be seen in Tilapia farming in Central Thailand. Here the industry is wrought with a “flawed representation of sustainability, embedded in discourse associated with attempts by the World Wildlife Fund (WWF), a major environmental non-governmental organization (NGO), to arrive at standards that promote responsible practices in … aquaculture” (Cowan et al., 1999, p. 840). Thai Tilapia are produced mostly for domestic markets and therefore international regulations are difficult to apply. Often the competing values of Thai farmers, NGOs, environmental groups and participants in export markets collide preventing headway from being made in sustainable laws and regulations. A reevaluation and renovation of both technical and institutional practices are vital in creating sustainable aquaculture. As Dierberg and Kiattisimkul (1996) discuss in their article “Issues, Impacts, and Implications of Shrimp Aquaculture in Thailand,” the government needs to allocate resources including time and money to promote sustainable farming practices (p. 649). Dierberg (1996) argues that educating the general public and training farmers should be the first major step (p. 649). It is important that government agencies have clear lines of communication and are aware of district boundaries so there is no “overlapping jurisdictions among agencies” (p. 649). Managing the land properly will take commitment by the local community to rehabilitate and monitor ponds and ensure the enforcement of regulations. Technical components include wastewater disposal and treatment, semi-intensive farming within mangrove areas, minimal water use systems, and removal of organic solids through oxidation (Dierberg et. al., 1996, para. 649). Such practices will eventually reduce disease outbreaks, water treatment and solids disposal costs and negative publicity. In addition, technical and institutional adjustments will encourage ecological health and higher sustainable farming yields (Dierberg et. al., 1996, para. 649). Thailand is currently facing an environmental crisis as world sea food demands are ever rising. If present aquaculture conditions and practices continue, the natural environment will be at serious risk destruction. However, if Thai government organizations can work with NGOs, international regulatory agencies and local Thai farmers to set regulations and policies, sustainability can be achieved. By funding and implementing new technologies, Thai farmers will be able to harvest marine life while maintaining ecological health for many years to come. Cowan, V. J., Lorenzen, K. & Funge-Smith, S.J. (1999). Water Quality in Shrimp Ponds. Aquaculture Research. 123-133. Dierberg, Forrest E., & Kiattisimkul, Woraphan. (1996). Issues, Impacts, and Implications of Shrimp Aquaculture in Thailand. Environmental Management Vol. 20 : No. 5. 649-666. Paez-Osuna, Federico. The Environmental Impact of Shrimp Aquaculture: Causes, Effects, and Mitigating Alternatives.” Environmental Management Vol. 28 (2001): No. 1. 131-140. Pongsri, C., & Sukumasavin, N. (2005, February 1). National Aquaculture Sector Overview. Thailand. National Aquaculture Sector Overview Fact Sheets. FAO Fisheries and Aquaculture Department [online]. 23 April 2011. Retrieved from http:// http://www.fao.org/ fishery/countrysector/ naso_thailand/en. Primavera, J.H. (1997 ). Socio-Economic Impacts of Shrimp Culture. Aquaculture Research. 815-827. Quarto, Alfredo. (December 1998). The Rise and Fall of the Blue Revolution, Mangrove Action. Project. Retrieved from http://mangroveactionproject.org/issues/shrimp-farming/ the- rise-and-fall-of-the-blue-revolution. Sea-Ex Australia (2011). 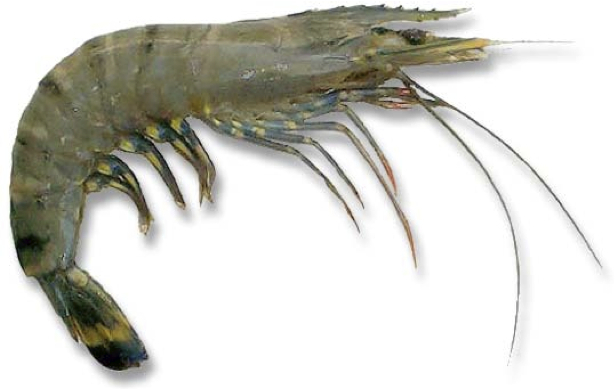 Tiger Prawn (Penaeus esculentus) & Black Tiger Prawn (Penaeus Monodon) Photographs and Information. Australian Fishing Photographs, Angling, Cooking & Species Information. Retrieved from http://www.sea-ex.com/ fishphotos/prawn,3.htm.